SARATOGA SPRINGS, NY. (April 16, 2018) – Nearly 400 middle and high school students from across the nation and China will be competing in the 11th annual National STEM League (NSL) Finals competition April 28-29. The competition returns to the Alumni Sports and Recreation Center (Armory) at Rensselaer Polytechnic Institute (RPI) again this year. 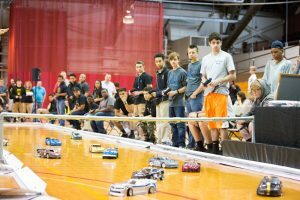 During this 2-day event, more than 50 middle and high school teams will compete for the Grand Championship. Students will put their innovation skills to the test in Student Racing and Student Rover Challenge competitions. Student UAV Challenge (drones) teams will make their first appearance this year and compete side-by-side with Racing and Rover teams. 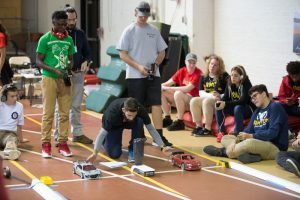 The Finals are the culmination of yearlong programs in which students think innovatively about how engineering performance and emerging technologies can improve personal, academic and professional pursuits. Students will tour the RPI campus on Saturday morning, engage in skills workshops Saturday afternoon then register and attend an opening banquet that evening. Sunday is a fast-pace day of competitions. 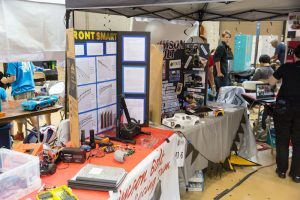 Students face each other in racing and robotics challenges, business enterprise presentations, engineering projects and graphic design. Following competitions, an awards ceremony will recognize winning teams and celebrate their countless hours of hard work, determination and preparation. The 2018 season has seen many exciting developments at Ten80 and the NSL. Ten80 partnered with SKT Education expanding the NSL into China. Traveling to Beijing last summer, Ten80 delivered a professional development institute on STEM education to 50 Chinese educators. These educators developed a broad field of vision, exchanged experiences and saw firsthand the results of Ten80’s comprehensive platform for STEM learning. Ten80 also developed a new Student UAV Challenge (drones). Miami-Dade middle schools piloted the curriculum throughout the 2017-18 school year and will compete for the first time at the 2018 NSL Finals. Media are invited to attend, interview, photograph and videotape the competition and the young innovators.